When it comes to your home, your safety and security are your number one concern. We understand that you want you, your family, and your property to be safe. At Bells Lock & Key, we can offer you the finest in locks and security systems. If you need a keypad, we can do that for you, too. Contact us and start feeling safer in your home sooner than you might expect. Owning a business can be a worrisome venture. You have enough to think about without thinking about the security of your office and what you keep there. At Bells Lock & Key, we specialize in industrial locks, security locks, and deadbolts for business use. We also have desks and cabinets that lock and offer extra security for your sensitive information and valuables. 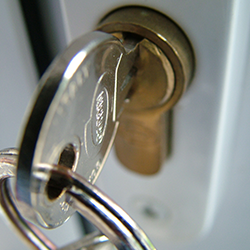 Our locks work as hard as you do to keep your business and trade secrets safe. With more than 40 lines of hardware available including, but not limited to, Medeco, Schlage and Quikset we will surely have a product for you.